Mining can be a relaxing and profitable activity in Elite. Limpet drones are generic ammo that is stored in your ship’s inventory (at 1t each ) until launched by a limpet controller. The limpet controller programs the limpet for a specific task, launches it, and controls it while it is performing its job. Some people recommend not including shields on a mining ship. While on the smaller ships that might be necessary, I find that even if you have to include a smaller-than-normal shield generator, having that extra buffer is helpful. Use this tool to find the nearest “pristine metallic”. A pristine metallic is a planetary ring (or possibly asteroid belt) that has a metallic composition and “pristine reserves”. This will get you the highest return on your time investment if you’re not looking for specific resources. Keep in mind that some planets may have multiple rings (like Jura 7 above). The rings are counted from the inside out, so the A ring will be closest to the planet, the B ring will be the next further out, etc. Navigate to the target system as normal. When flying to the ring, fly as normal to the vicinity of the planet, 100% throttle until the timer is less than 30 seconds, then 75% throttle. 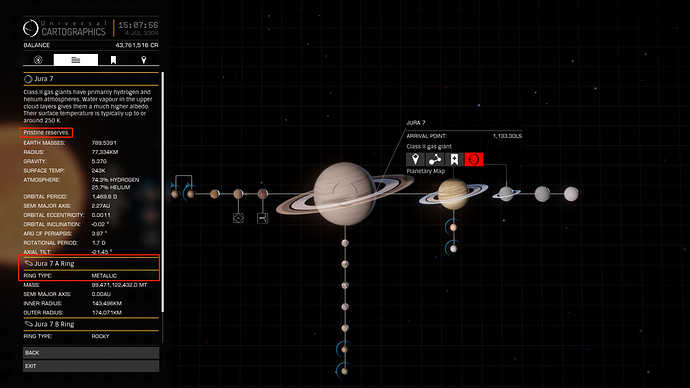 Pick a location on the ring that isn’t a resource extraction site, unless you want to get jumped by pirates. Then when you’re getting close to the ring, slow wayyyyyyy down. You want to be going close to 0-2% throttle as you get close to the ring, then let proximity drop you out. Note: The game will often spawn ships, sometimes pirate ships, near where you drop out. I recommend boosting away from your initial drop point before you start mining to avoid any pirate problems. As your collector limpets deliver unrefined asteroid chunks to your cargo bay, your refinery will refine them into the eventual resources that you are going to sell for credits. A particular chunk will consist of one or more of the asteroid’s available resources in some quantity. The refinery will split those resources into “bins”. When a bin fills up, 1t of that resource is deposited in your ship’s inventory. Notice that all the expensive stuff (other than the exceedingly rare Low Temperature Diamonds) are available in metallic rings.